尹志刚, 宫兆民, 张跃龙, 韩宇, 王阳, 曹忠强, 李海娜, 李敏. 大兴安岭伊勒呼里山早白垩世碱长花岗岩年龄、地球化学特征及其地质意义[J]. 地质通报, 2018, 37(6): 1061-1074. Yin Z G, Gong Z M, Zhang Y L, Han Y, Wang Y, Cao Z Q, Li H N, Li M. Geochronology, geochemistry and geological sig-nificance of the Early Cretaceous alkali feldspar granites in the Yilehuli Mountain, Da Hinggan, Mountain[J]. Geological Bulletin of China, 2018, 37(6): 1061-1074. Abstract: Petrographic and geochemical data and LA-ICP-MS zircon U-Pb ages were obtained for Early Cretaceous alkali feldspar granites of the Yilehuli Mountain. The major elements of Yilehuli alkali feldspar granites are high in Si, ALK, and low in Mg, Ca. 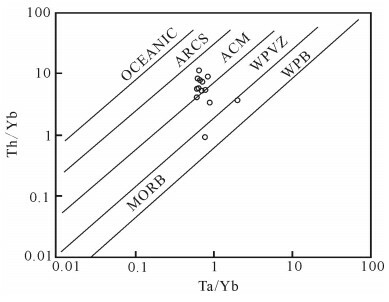 Trace elements are enriched in incompatible elements such as K, Rb and Th, and depleted in Sr, P, Eu and Ti. 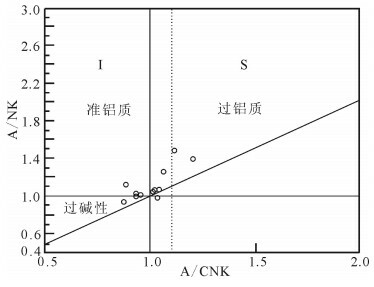 Geochemical features indicate that alkali feldspar granites are aluminum A-type granites (A/CNK=0.88~1.21, A/NK=0.94~1.49). LA-ICP-MS zircon U-Pb age data of coarse-medium alkali feldspar granites and fine-medium alkali feldspar granites are 140.3 ±1.0Ma and 137.9 ±0.8Ma, respectively, indicating that intrusive rocks were formed in Early Cretaceous. Combined with regional geological investiga-tion, the authors hold that the formation of Yilehuli plutons was closely related to lithospheric extension caused by closure of the Mongol-Okhotsk Ocean, and that the primary magma was derived from partial melting of crustal materials. 张福江. 大兴安岭伊勒呼里山成矿亚带典型矿床特征及找矿方向[J]. 西部资源, 2014(2): 167–169. 尹志刚, 王文材, 张跃龙, 等. 伊勒呼里山中生代火山岩:锆石UPb年代学及其对岩浆事件的制约[J]. 吉林大学学报(地球科学版), 2016, 46(3): 766–780. Yuan H, Gao S, Liu X, et al. Accurate U-Pb age and trace element determinations of zircon by laser ablation-inductively coupled plasma-mass spectrometry[J]. Geostandards and Geoanalytical Research, 2004, 28(3): 353–370. DOI:10.1111/ggr.2004.28.issue-3. 唐杰, 许文良, 王枫, 等. 张广才岭帽儿山组双峰式火山岩成因:年代学与地球化学证据[J]. 世界地质, 2011, 30(4): 508–520. Belousova E, Griffin W L, O'Reilly S Y, et al. 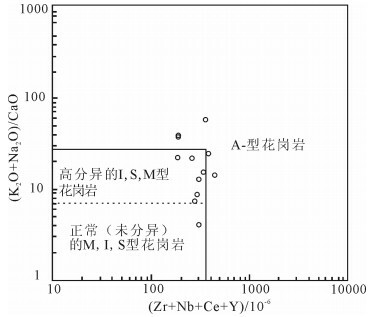 Igneous zircon:trace element composition as an indicator of source rock type[J]. Contributions to Mineralogy and Petrology, 2002, 143(5): 602–622. DOI:10.1007/s00410-002-0364-7. Yan M, Chi Q. The chemical compositions of the continental crust and rocks in the eastern part of China[M]. Science Press, 2005. 宋维民, 庞雪娇, 付俊彧, 等. 内蒙古科尔沁右翼中旗碱长花岗岩锆石U-Pb年代学, 岩石地球化学及其动力学意义[J]. 吉林大学学报(地球科学版), 2015(3): 847–859. 邓晋福, 罗照华, 苏尚国, 等. 岩石成因, 构造环境与成矿作用[M]. 北京: 地质出版社, 2004. 邓晋福, 刘翠, 冯艳芳, 等. 关于火成岩常用图解的正确使用:讨论与建议[J]. 地质论评, 2015, 61(4): 717–734. 纪政, 葛文春, 杨浩, 等. 大兴安岭中段塔尔气地区早白垩世花岗岩成因及形成构造环境[J]. 世界地质, 2016, 35(2): 283–296. 张旗. A型花岗岩的标志和判别——兼答汪洋等对"A型花岗岩的实质是什么"的质疑[J]. 岩石矿物学杂志, 2013, 32(2): 267–274. 孙德有, 吴福元, 高山, 等. 吉林中部晚三叠世和早侏罗世两期铝质A型花岗岩的厘定及对吉黑东部构造格局的制约[J]. 地学前缘, 2005, 12(2): 263–275. 苟军, 孙德有, 赵忠华, 等. 满洲里南部白音高老组流纹岩锆石U-Pb定年及岩石成因[J]. 岩石学报, 2010(1): 333–344. 宋维民, 庞雪娇, 付俊彧, 等. 内蒙古科尔沁右翼中旗碱长花岗岩锆石U-Pb年代学, 岩石地球化学及其动力学意义[J]. 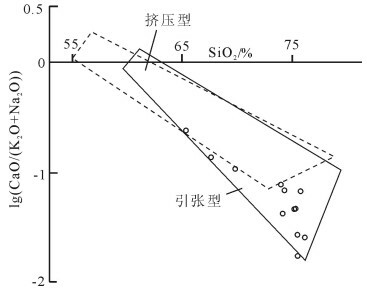 吉林大学学报(地球科学版), 2015, 45(3): 847–859. 张旗, 冉皞, 李承东. A型花岗岩的实质是什么?[J]. 岩石矿物学杂志, 2012, 31(4): 621–626. 钱兵, 高永宝, 李侃, 等. 新疆东昆仑于沟子地区与铁-稀有多金属成矿有关的碱性花岗岩地球化学、年代学及Hf同位素研究[J]. 岩石学报, 2015, 31(9): 2508–2520. 张旗, 王焰, 李承东, 等. 花岗岩的Sr-Yb分类及其地质意义[J]. 岩石学报, 2006, 22(9): 2249–2269. 张旗, 金惟俊, 李承东, 等. 再论花岗岩按照Sr-Yb的分类:标志[J]. 岩石学报, 2010, 26(4): 985–1015. 林强, 葛文春, 吴福元, 等. 大兴安岭中生代花岗岩类的地球化学[J]. 岩石学报, 2004, 20(3): 403–412. 杨高学, 李永军, 张兵, 等. 新疆西准噶尔接特布调A型花岗岩年代学、地球化学及岩石成因[J]. 地球学报, 2015(3): 41–52. 刘杰勋, 郭巍, 朱凯. 辽东岫岩地区早白垩世侵入岩的年代学、地球化学及地质意义[J]. 岩石学报, 2016, 32(9): 2889–2900. 张旗, 王焰, 潘国强, 等. 花岗岩源岩问题——关于花岗岩研究的思考之四[J]. 岩石学报, 2008, 24(6): 1193–1204. Xu W L, Ji W Q, Pei F P, et al. Triassic volcanism in eastern Heilongjiang and Jilin Provinces, NE China:chronology, geochemistry, and tectonic implications[J]. 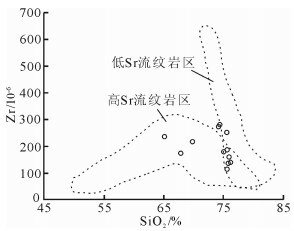 Journal of Asian Earth Sciences, 2009, 34(3): 392–402. DOI:10.1016/j.jseaes.2008.07.001. 尹志刚, 张跃龙, 杜玉春. 大兴安岭北部早白垩世上库力组流纹岩的地球化学特征及成因[J]. 吉林大学学报(地球科学版), 2013(3): 788–796. 王德滋, 刘昌实, 沈渭洲, 等. 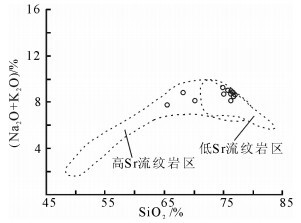 桐庐I型和相山S型两类碎斑熔岩对比[J]. 岩石学报, 1993, 9(1): 44–54. 高阳, 张招崇, 杨铁铮. 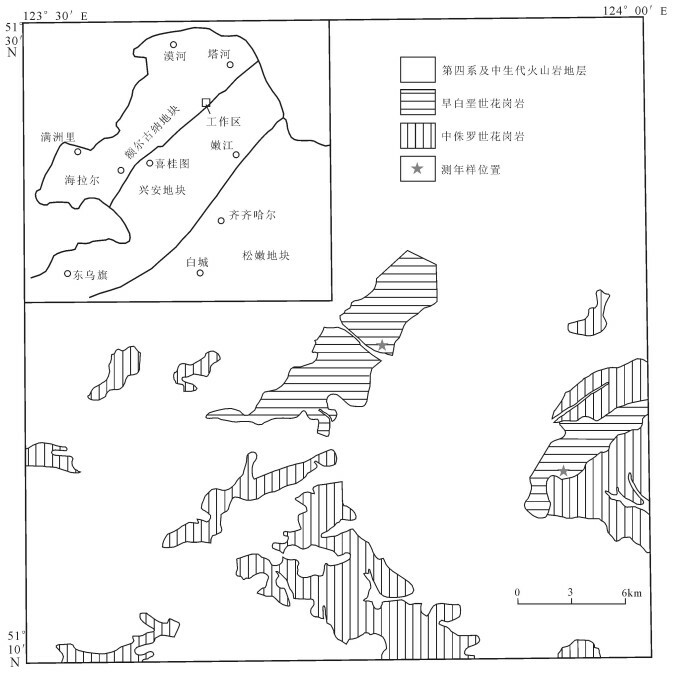 黑龙江宝山一带海西晚期强过铝花岗岩地质地球化学及岩石成因[J]. 岩石矿物学杂志, 2009, 28(5): 433–449. Taylor S R, McLennan S M. The chemical composition of the Archaean crust[J]. Geological Society, London, Special Publications, 1986, 24(1): 173–178. DOI:10.1144/GSL.SP.1986.024.01.16. 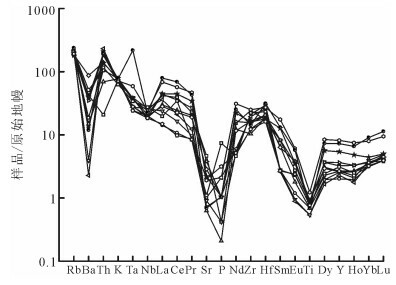 Lightfoot P C, Hawkesworth C J, Sethna S F. Petrogenesis of rhyolites and trachytes from the Deccan Trap:Sr, Nd and Pb isotope and trace element evidence[J]. 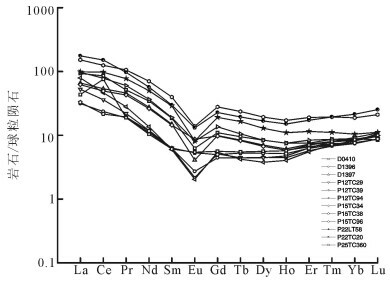 Contributions to Mineralogy and Petrology, 1987, 95(1): 44–54. DOI:10.1007/BF00518029. 李佐臣, 裴先治, 李瑞保, 等. 西秦岭糜署岭花岗岩体年代学、地球化学特征及其构造意义[J]. 岩石学报, 2013, 29(8): 2617–2634. Liegeois J P, Navez J, Hertogen J, et al. 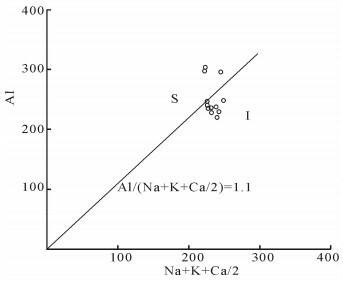 Contrasting origin of postcollisional high-K calc-alkaline and shoshonitic versus alkaline and peralkaline granitoids. The use of sliding normalization[J]. Lithos, 1998, 45(1): 1–28. Barbarin B. A review of the relationships between granitoid types, their origins and their geodynamic environments[J]. Lithos, 1999, 46(3): 605–626. DOI:10.1016/S0024-4937(98)00085-1. Zhao X, Coe R S, Gilder S A, et al. 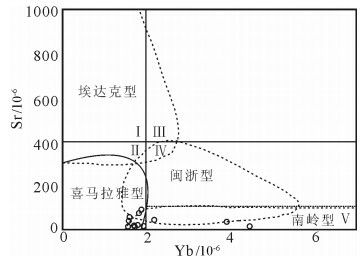 Palaeomagnetic constraints on the palaeogeography of China:Implications for Gondwanal[J]. Australian Journal of Earth Sciences, 1996, 43(6): 643–672. DOI:10.1080/08120099608728285. 赵振华. 关于岩石微量元素构造环境判别图解使用的有关问题[J]. 大地构造与成矿学, 2007, 31(1): 92–103. 孟凡超, 刘嘉麒, 崔岩, 等. 中国东北地区中生代构造体制的转变:来自火山岩时空分布与岩石组合的制约[J]. 岩石学报, 2014, 30(12): 3569–3586. Tomurtogoo O, Windley B F, Kröner A, et al. 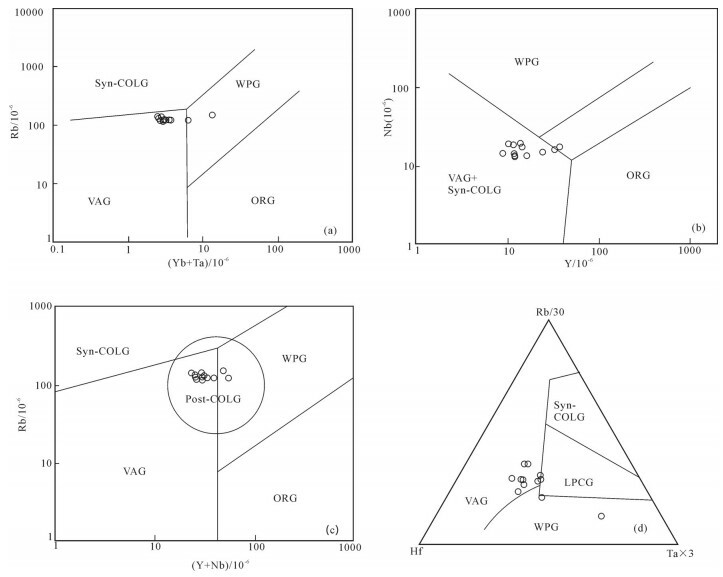 Zircon age and occurrence of the Adaatsag ophiolite and Muron shear zone, central Mongolia:constraints on the evolution of the Mongol-Okhotsk ocean, suture and orogen[J]. Journal of the Geological Society, 2005, 162(1): 125–134. DOI:10.1144/0016-764903-146. 徐美君, 许文良, 王枫, 等. 小兴安岭中部早侏罗世花岗质岩石的年代学与地球化学及其构造意义[J]. 岩石学报, 2013, 29(2): 354–368. Wang F, Zhou X H, Zhang L C, et al. Late Mesozoic volcanism in the Great Xing'an Range (NE China):timing and implications for the dynamic setting of NE Asia[J]. Earth and Planetary Science Letters, 2006, 251(1): 179–198. Xu W L, Pei F P, Wang F, et al. Spatial-temporal relationships of Mesozoic volcanic rocks in NE China:constraints on tectonic over-printing and transformations between multiple tectonic regimes[J]. Journal of Asian Earth Sciences, 2013, 74: 167–193. 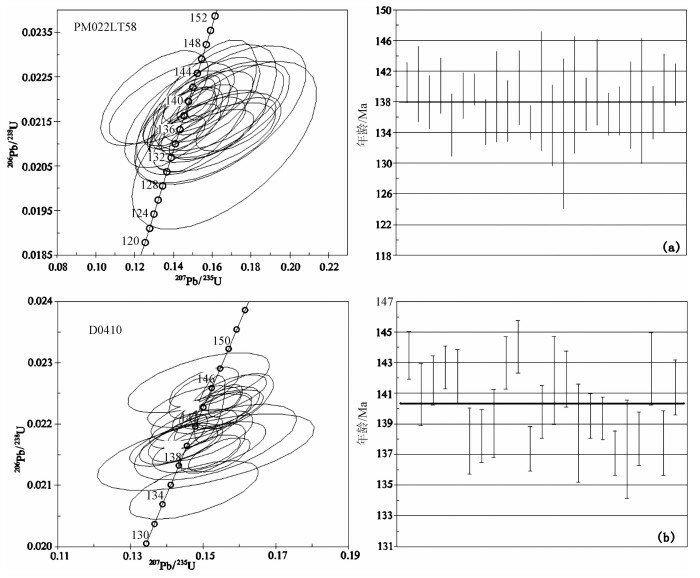 DOI:10.1016/j.jseaes.2013.04.003. Maruyama S, Send T. Orogeny and relative plate motions:example of the Japanese Islands[J]. Tectonophysics, 1986, 127(3/4): 305–329.